Chioma Udeogu hopes one day she will be able to visit her baby girl's grave thousands of miles away from her home in Nigeria. Her daughter, Favour, was delivered stillborn after failings in her care at the Royal Glamorgan hospital in January 2017. Mrs Udeogu believes her child would still be alive if staff had listened to her calls for help. Cwm Taf health board acknowledged there had been failings. An investigation by the health board following Favour's death found midwives failed to carry out any required antenatal checks on Mrs Udeogu for 12 hours - and when they did no heartbeat was found. 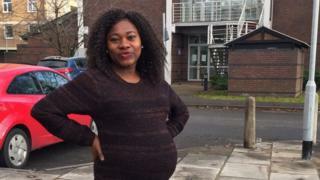 "[The consultant] said to me he was sorry but my baby was gone...I had my baby and she was lifeless," said Mrs Udeogu, who was studying at the University of South Wales and now lives in Nigeria, about 4,000 miles from where her baby is buried in Glyntaff Cemetery in Pontypridd. "I never planned it that way, I was ready for my baby, I had everything, I'd bought everything I needed to buy...just at the end of it, it was all mistakes and I lost my baby." She shared her story with BBC Wales after Cwm Taf announced it was investigating the stillbirths of 20 babies and six babies who died shortly after birth at its maternity units. Mrs Udeogu was 41 weeks pregnant with her first child when she started getting contraction pains and rang the hospital at 05:15 GMT on 14 January 2017. She was told she could go home by a registrar, who checked the baby's heart rate and instructed a plan of care for close observation, however she was admitted to the ward after being too worried to leave. But despite repeatedly asking for help, her baby was not checked again for another 12 hours, when no trace of a heartbeat was found and at 23:20 she was told her daughter was dead. "I was really devastated," she said. "It's something I don't wish to happen to my enemy, because my husband was not in the UK, my parents were not there, I only have friends around me, I do not have any family members around me, so it was really isolating for me," she said. Mrs Udeogu was induced the next morning, and her daughter, Favour Adaoma was delivered stillborn at 10:50 on 15 January, weighing 3.61kg (7.95lbs). "The moment I had my baby she was dead, but I was thinking she was sleeping, because I didn't really believe what was happening to me," she said. "It was the next morning that I came back to my senses that I don't have my baby any more." With the support of her friends Mrs Udeogu buried her daughter before she returned to Nigeria in April. "Since I've been back in Nigeria I've only had memories....I would like to visit her," she said. An investigation by the health board found midwives failed in their duty of care of Mrs Udeogu by not performing neonatal assessments, which are required every four hours according to guidelines. The report also found poor communication between midwives and staffing issues on the ward, with one midwife saying they felt overwhelmed and extremely stressed that day. Months after the review, the board wrote to Mrs Udeogu's solicitors to offer their "sincere apologies for the way in which our services let her down". It accepted her care fell below an acceptable standard but said it was not possible to confirm whether the baby would have survived if she had been delivered sooner. "In the early hours of the morning she had a heartbeat, they told me everything was fine," said Mrs Udeogu. "I was just shocked and surprised at the end of it, after so many hours when they checked me and told me that my baby was gone. "I believe that if I was properly monitored in the hospital I wouldn't have lost her". Image caption Following Favour's death the health board wrote to Mrs Udeogu's solicitors saying they had "let her down"
A Cwm Taf spokeswoman said: "As in every case where failings are identified an apology is made and appropriate redress offered. "Losing a baby is a devastating experience and we sincerely sympathise with all those who have experienced such a sad loss. "The review we have announced into how some past cases were investigated has inevitably caused anxiety, but we would like to assure all the women who use our maternity service that every safeguard is in place to ensure they are provided with the best possible care."